Please go to the link above for a slide show of several of Leonard Lauder's favorites, as he explains in the captions; the example below graces the cover of the catalogue for The Postcard Age: Selections from the Leonard A. Lauder Collection. In 1938 or '39, a boy of five or six, or maybe seven, was so enthralled by the beauty of a postcard of the Empire State Building that he took his entire five-cent allowance and bought five of them—all exactly the same image. "I can see that postcard today," Leonard Lauder said of the purchase that turned him into a collector for life. And though he is known widely for his unsurpassed cache of Cubist art and his many gifts of blue-chip American art to the Whitney Museum, Lauder has maintained an obsession with micro-pictures all his life. He owns about a hundred and twenty-five thousand postcards—at the moment. They're not—save those first few—the standard-issue travel postcards that fill those swirling display stands in tourist traps around the world. Lauder collects sports postcards, fashion postcards, war postcards, advertising postcards, celebrity postcards, industrial postcards, and history postcards, mostly lithographs or vintage photographs, by known and unknown artists alike. One series chronicles the history of the postcard industry. They are, in Lauder's words, "miniature masterpieces," and very much museum-worthy. Several years ago, he donated twenty thousand postcards made by early-twentieth-century Japanese artists to the Museum of Fine Arts in Boston, then followed that with a promise to give another hundred thousand postcards. 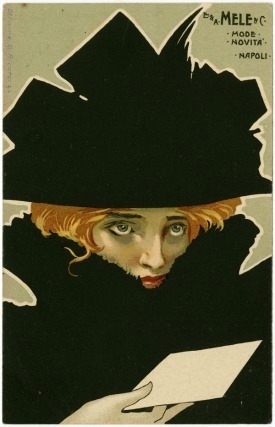 From that massive stash, nearly seven hundred cards made in the years surrounding the turn of the twentieth century, when billions of postcards were popped into the mail all over the world, are on view there in "The Postcard Age: Selections from the Leonard A. Lauder Collection." Late one recent Friday afternoon, Lauder, wearing a lipstick-pink-and-white checked dress shirt and dark slacks, sat on a tufted bench in his cream-and-blue fortieth floor office at Estée Lauder Companies, which brimmed with art by Richard Serra, Jeff Koons, Agnes Martin, Joseph Cornell, Beverly Pepper, and Claes Oldenburg, and paged through a copy of the exhibition's catalogue with me. "This is gorgeous," he said. "Look at that style." "I love this one." "Look at the art in these." "How can you not love that one?" Lauder skipped through the catalogue pages quickly, and that's the way he bought his postcards: mostly one at a time, in prowls through the kiosks along the Seine in Paris and the stands of Portobello Road in London, and from stamp dealers, antique stores, and auction houses around the world. Sometimes, he said, dealers would send him specimens. "I'd come back from a trip and find a package with a fax or an e-mail, but I don't want them to do that," Lauder says. "I'd rather go through ten thousand cards and pick out three. I am pretty good at snap judgments." Lauder, along with two curators, Lynda Klich and Benjamin Weiss, selected the cards for the exhibition, which illustrate urban life, the changing role of women, sports, celebrity, new technologies, art nouveau, and the First World War. "We looked at them together, and they got what they wanted and I got what I wanted," Lauder says; as they did, the number of cards in the show grew from 400 to 700. Yet only once in going through the 296-page catalogue did he stop and say "Those were gimmes" – two 1922 postcards advertising Madeleine Vionnet's fashion house – and move on. If his friends, children, and grandchildren know only vaguely about this passion, it's not because he keeps it secret. It's just that the cards, unlike his paintings, are not within the view of visitors, but rather in boxes and albums. "The only one I showed everything to was my wife," he said sadly; she died of cancer last year. "Evelyn often said my postcard collection was my mistress." Slowly, Lauder is sending his cards, group by group, to their permanent home in Boston, though that won't be the end of his involvement with them. And does he have an idea for their next exhibition? "Propaganda," he said, without a moment's hesitation.